Harry is carrying out several engagements without his wife after the Duchess of Sussex decided to scale back her plans on the royal tour. More than 500 competitors are taking part in 13 sports at the event in Sydney. 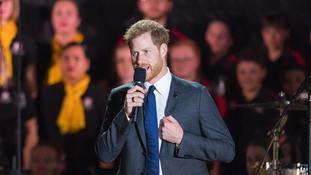 Prince Harry has climbed Sydney Harbour Bridge to raise the Invictus Games flag ahead of the competition's opening ceremony. 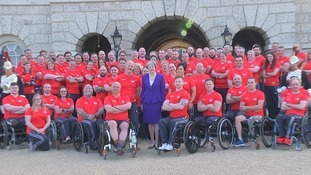 The Invictus Games have grown from the initial idea created by Prince Harry, into an international event involving veterans from 18 nations. A team of injured veterans will compete against professional racing drivers at the British GT Championship this weekend. The family of a soldier whose coffin was loaded onto the plane which flew Prince Harry back from Afghanistan has met the Prince. In footage obtained by ITV News, the couple were joined by Meghan's mother as they watched Bruce Springsteen at the Invictus Games. The Games have been hugely inspiring - once you see what can be achieved against the odds, you'll look at your own life differently. Eighteen-year-old Hayley Stover made many girls jealous by getting the seat next to Prince Harry at the Invictus Games in Toronto. 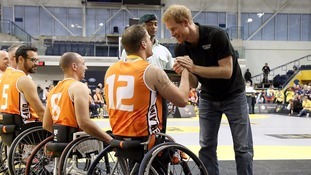 Barack Obama was the surprise spectator at Wheelchair Basketball as he lent his support to the founder of the Invictus Games Prince Harry.